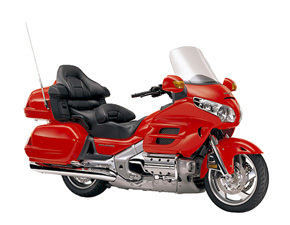 Honda has announced that for 2004 it’s flagship tourer, the Goldwing, will now be available in an all new stunning color schemes, Flare Red and Pearl Challenger Brown. Standard fitment on this model continues to include a 6 stacker CD player, 4 speaker surround sound, AM/FM radio, cruise control, motorized adjustable headlight, headset for both rider and passenger, heated grips, adjustable windscreen, electric reverse, and pannier inner bags. The exhaustively tested 1832cc liquid-cooled horizontally opposed six-cylinder engine is 1kg lighter than the previous design. Parallel two-valve cylinder head design utilizes direct, shim-under-bucket valve actuation and requires no 1000km service; the first valve clearance inspection is at 50,000km. 6.9-litre air-box supplies a large volume of cool clean air to the engine. Two 40mm-diameter throttle bodies deliver air to six, specially designed Keihin(r) 50-psi high-pressure fuel injectors. Fuel is delivered through four nozzle tips in each injector, producing an atomized fuel mixture that is highly combustible, for optimum efficiency and power. Electronic CPU provides two digital 3-D fuel injection maps for each cylinder and one digital 3-D ignition map for each cylinder, creating ideal fuel mixture and spark advance settings for superb ride ability. Unique knock-control sensor monitors ignition advance to improve performance throughout the entire rpm range. CPU-controlled, closed-loop emission control system utilizes two oxygen sensors to constantly deliver a precise, air/fuel mixture while two exhaust catalyzers reduce emissions of carbon monoxide, hydrocarbons and nitrogen oxides further. High-pressure-formed, sintered iron Nickalloy(tm) crankshaft bearing caps provide quiet engine operation throughout the engine's operating temperature range. 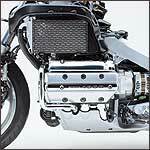 Powerful new fuel-injected 1832cc six-cylinder engine produces smooth, effortless power-118 bhp and 125 lb./ft. 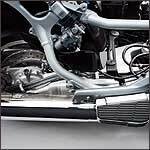 of torque-while meeting the California Air Resources Board (CARB) 2008 emissions standards. Beautiful multi-box-section aluminium dual-spar frame assembly is 11kg lighter than the previous steel design. Engineered with a Pro Arm(r) single-side cast aluminium swing-arm, the 2001 Gold Wing sets new class standards for handling. Honda's proven Linked Braking System(r) (LBS(r)) provides superb braking power in a wide range of operating conditions. Optional model adds Anti-Lock Brake System (ABS) for even better control during hard braking. 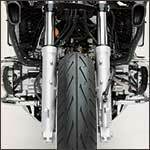 · All-new anti-dive system minimizes front fork dive when braking. · New, computer-controlled adjustable hydraulic rear suspension preload. · Redesigned slow-speed electric reverse system. · All-new, lightweight electronic cruise control system. · Remote control operates trunk and locks/unlocks trunk and saddlebags. · State-of-the-art audio system with CD player. · A complete line of bolt-on accessories and appearance items. The parallel two-valve cylinder head design, together with side-mounted radiators, allows the engine to be moved forward 50mm for optimum ergonomics, with excellent rider foot room and an enlarged passenger cockpit. 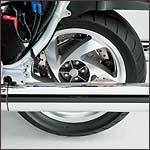 Placing the rider closer to steering axis also improves steering feel and helps assure even better handling. All-new, slow-speed electric reverse system is engaged with the simple push of two thumb controls on the right handlebar. All-new, lightweight electronic cruise control system utilizes a 16-bit CPU-controlled, motor-actuated throttle mechanism that is 2.5 times more sensitive to speed variation and responds 40 percent more rapidly than the previous system. 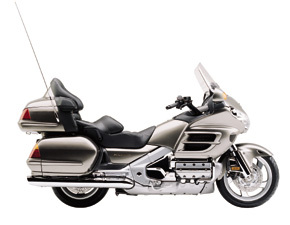 The Gold Wing's aerodynamic bodywork is functional as well as beautiful, providing excellent rider wind protection while reducing the drag coefficient a remarkable 10 percent compared to the previous design. A simple yet ingenious, ratcheting-windshield adjustment system provides six settings over nearly 100mm of travel. Operated manually, the mechanism eliminates the weight and complexity of electric motors. The Gold Wing trunk provides 61 litres of storage capacity with an additional 5 litres of storage available if the optional CD-changer is not installed. Two full-face helmets fit easily in the trunk. The saddlebags provide 40-plus litres of storage each, resulting in a total of 147 litres of storage space. Specially designed luggage features a remote control key-lock, permitting pop-open rear trunk operation, a remote lock/unlock feature for the trunk and the saddlebags, and a horn-actuated bike locator. If remote locking is attempted while a lid is open, the emergency lights flash to alert the rider. Soft-touch elastomer provides a luxurious feel to the front console, front and rear pocket covers and the passenger armrests. Ergonomically designed saddle with a low, 739mm seat height has a plush passenger seat with 50mm more room than the previous model. Integral backrest and side support provide all-day riding comfort. Panasonic (tm) state-of-the-art audio system features two enclosed 25-watt stereo speakers for full-spectrum music reproduction with superb bass. 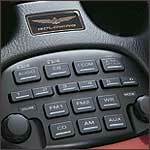 Features include 12 FM and six AM preset stations, weather band radio, station auto-select, headset-ready intercom, auxiliary adapter, ambient audio enhancement, auto volume control, and audio mute. Intuitively designed, console-mounted controls provide all set-up functions while ergonomically designed controls mounted on the left handlebar make rider-activated audio selection a simple process. A hooded, high-resolution LCD display is easy to read in all riding conditions. Options include trunk-mounted six-disc CD changer, 25-watt rear speakers, and a 40-channel CB radio. Completely redesigned instrument cluster includes white-on-black analogy displays for speedometer, tachometer, coolant temperature and fuel level, and features adjustable backlighting and high-luminescence red pointers. A LCD clock is located in the speedometer face. A high-resolution 110 x 254 dpi LCD, housed in a separate module, is legible in all lighting conditions and displays the odometer, A/B trip meter, ambient temperature, audio modes, CB, rear suspension setting, and trunk-open indicator. Indicator/warning lights are provided for reverse, neutral, overdrive, oil pressure, fuel injection, high beam, side stand, cruise on, cruise set, and low fuel. New motorized headlight aiming system is operated by a dial switch located on the left fairing panel and provides 2.5 degrees of adjustment from level. Large 25 litre fuel tank houses the EFI fuel pump and provides excellent long-distance cruising range. Click on the PDF file to download the model details and specifications. You will need Adobe Acrobat Reader to view this file. Go to ‘Pitstop’ for instructions on how to download the latest version.